SNOW WHITE AND THE SEVEN NOBBITS is Red Deer Players' Christmas Pantomime and will be playing at the Scott Block Theatre from Boxing Day until January 3rd. Tickets are available from the Black Knight Inn or at the door (Adults $20, Kids & Seniors $15). 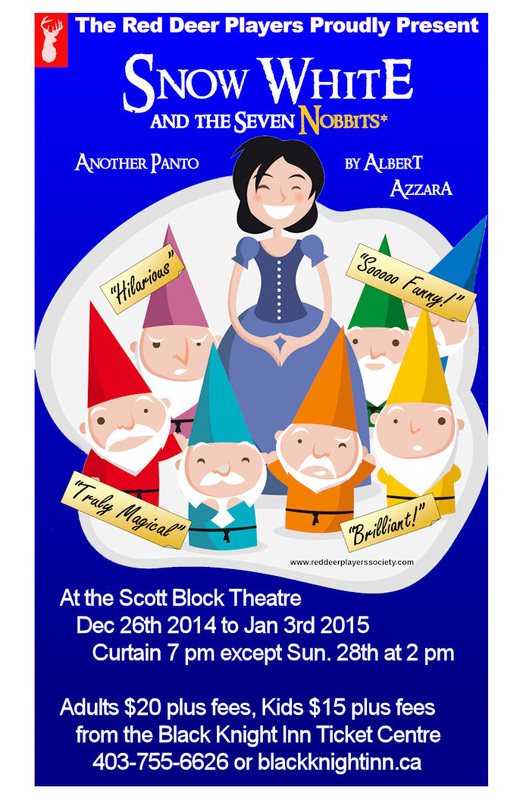 PANTOMIME is a form of music hall theatre that borrows stories that are (very) loosely based on fairy tales. This year we chose Snow White. If you are familiar with this story, you may notice some slight resemblance to that wonderful timeless classic. Our writer, Albert Azzara, has taken considerable liberties with a centuries old story; updating it in his usual zany fashion. He’s added some local flavouring and content in the true timeless spirit that Panto is all about. You’ll find many peculiar characters gracing our stage today. Our star is the beautiful Snow White supported by her goodly friends Buttons and Bingo the Panto Horse. There’s brash but kind Mother Twerk and her very odd family, the handsome Chad Charming and the well named Mr. Nasty. There are also true villains such as Lady Borden, Butterworth and Gooner the Hitman who just beg to be booed by the audience! Well, you’ll soon get the idea. Enjoy! PLOT SYNOPSIS Lady Borden, Snow White's wicked stepmother, treasures the magical Tablet App that tells her she is the most beautiful woman in the world. However, things change when an earthquake hits the area at the precise moment of Snow White's birthday. At 18, Snow White is now a young lady, no longer just a girl, and because she is so beautiful she automatically takes over the title as the Number One Beauty in the World. Lady Borden is horrified to find out she is now Number Two, so with Snow White's father safely out of the way up Mount Everest, she plots with her two-faced butler, Butterworth and the evil Gooner McGoonigal to "do away" with Snow White. With the help of her best friend Buttons, Snow White and her faithful horsey companion Bingo manage to escape from that evil trio as well as a hoard of admirers of various types. They head up to her father's hunting lodge on Redford Ridge only to be waylaid by Gooner, the despicable Calgary Hitman (Boooo!). Meanwhile, in Nordegg, the Twerks, Button's adopted family consisting of Mother and her seven Nobbits, discover that the mine that they had been running for years has collapsed in the earthquake. While checking the damage, they find and rescue the injured Snow White. With the imminent seizure of their mine by the bank, Bingo saves the day in a most unusual way!! Oh yes, and there is a handsome young man, Chad Charming, who charms Snow White and they end up “happily ever after”, which is, after all, how all fairy stories are supposed to end!